Author Kerry McCaughan, from Hillsborough Co Down, was competing in her 8th Waggy Races at Mount Stewart and in December 2013, was the first ever person to enter Waggy Races. She is one of a core team of run directors at Wallace parkrun in Lisburn and runs with Dromore Athletics Club. I woke early on Sunday morning, filled with excitement and anticipation at the thought of taking part in, no, competing in Waggy Races VIII. Although I have 2 dogs, I had made the strategic decision to compete in the ‘pack’ category (2 people, 1 dog), such was my will to do well in this canine friendly competition. I roped in my wearily obliging best friend, Beverly, and signed us and Lord Mack, my Canine Athlete, up for the 8th time. Beverly is no stranger to Waggy Races, having competed on several other occasions with my other, not so athletic dog, King Finn. This would be the first time that she would be running without unhelpful Finn to slow her down, (another strategic decision on my part) so, with Beverly’s newly found speed over 5k, Lord Mack’s amazing athleticism and pulling power over the same distance, and my … optimism, I had high hopes for this trio of Waggy Stalwarts. The drive to Mount Stewart was intense, none of us was in the mood for conversation, least of all Mack. He was focus dogified. I like to think we bonded through silence as a team during that journey. We turned into the gates of Mount Stewart in good time, and were highly impressed by the amount of professional looking marshals with what appeared to be actual walkie-talkies. We sensed that this was going to be the biggest and most important Waggy Races yet – Mack showed his dedication by immediately emptying his bowels almost as soon as we commenced our walk to the start line – this is a good thing in Waggy Races circles, because an impromptu poo during a race can obliterate all hopes of a podium position. My optimism was only heightened at that point. Poop dutifully scooped, we made our way to registration – you can imagine my delight when Ruth informed me that we were setting off in wave 2, in lane 2, and our race number was 22. Mack had already done his number 2, so at this point all the stars were aligned in my mind. Even Beverly raised an eyebrow in anticipation at that point. With twenty minutes to kill before the gun, we were able to take in our surroundings – Mount Stewart was resplendent in the sunshine, and the atmosphere was fantastic – I’m always amazed by how friendly this event is, and how diverse its participants are. We chatted to other regular racers and tried to play down our competitiveness. The first wave lined up, and we took our positions behind them, ready for our start. The bell went, and the usual cacophony of barking, laughter, shouts, and thundering feet and paws ensued. It was a blur of fur and bodies – it was difficult to tell who was more excited, the dogs or the humans! As predicted, Mack decided he would like to start with a 6 minute mile pace for the first quarter of a mile – I held on desperately, wondering if we could sustain this for a full 5k, and so delirious was I with excitement, I had dreams of ditching my pack buddy Beverly and just winning the whole thing. Back to reality, and we were in full flight, the course was dry, interesting and there were some breath-taking views. Not that I was able to look around much; it was eyes forward all the way and hold on for dear life. I tried to look back to see where Beverly was, but it was impossible, such was our momentum. We kept going hard, Mack was desperate to pass as many dogs as he could, but as predicted, we started to slow when faced with the first major hill of the day at the start of about mile 3. We were both tired and starting to flag, when Beverly suddenly appeared at my shoulder, seeming to skip up the hill as if it didn’t exist. She coaxed us up to the top where apparently there is a temple – I didn’t notice it due to both oxygen deprivation and the fact that my eyes were now rolling in my head, but it’s meant to be lovely. We careered down the other side of the hill and started to dream of finishing, when we found ourselves running through a big field with really, really long grass (or so I imagined). My legs were dead, Mack was still in good spirits, Beverly was shouting at me to pump my arms and I think she started to talk about ‘taking people out’. I was thinking more about trying not to pass out. She could see another pack in front and we were tantalisingly close to them – she wanted to (Gulp) ‘take them out’. We battled on through the field and back onto a wooded trail path. The path was narrow, and we couldn’t get past the pack in front, although we were right behind them. We were only a couple of hundred yards from the finish when the pack took off down the last hill before the finish. We couldn’t catch them, but we (I) nearly died trying. I was delighted with our performance and (ahem) team work, and the three of us took a well-deserved break in the dog friendly tea room, joined by fellow Waggy Racer and Dromore Athletics Club member, Kim with her gorgeous working cocker, Olly, and husband Ian. Filled with tea and cake, we made our way back to the finish line to watch the prize-giving. 136 combinations of entrants took part that day, the biggest yet! The male and female podium winners consisted of mainly veteran Waggy Racers and a couple of newbies. 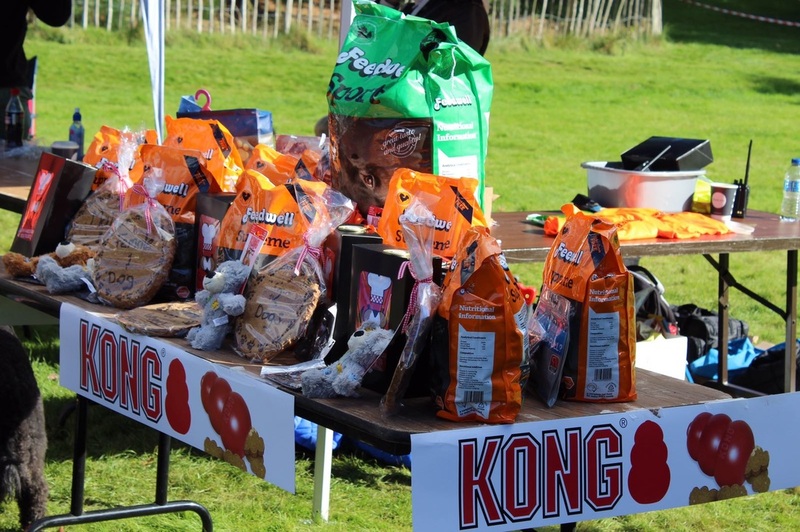 The 2 dogs category was won by Paul Morton again. We tried to look casual and nonchalant as Ruth started to announce the winners in the pack category. Because of the wave starting system, we had no idea where we had finished, so when our names were called out in third place it took all my strength and composure not to scream, punch the air, slide along the ground on my knees and cry with delight. Instead, Beverly and I just raised eyebrows at each other and laughed nervously. I proudly led my team to the podium – a first for me and Mack – where we were joined by the second placed pack (the ones we chased unsuccessfully) and the winners. Mack sportingly congratulated winner Rascal with an obligatory sniff of the bum, which was captured beautifully by Mark Winter of Frontline Freelance Media. Mack Loved his KONG toy. My day couldn’t get any better – or could it? At each race, there is a ‘Spirit of Waggy Races’ award, for whomever Neil and Ruth decide is deserving of such a prestigious accolade. Ruth started to present it, while I looked on, ready to cheer the worthy winner. I heard words like, ‘has entered all of the races’, ‘was the first person to ever enter’, ‘is here with just one dog today because her other dog is ill and can’t be here’ but only when she actually said my name did I realise Ruth was talking about me! I was really touched and quite emotional. You see, it was less a strategic decision to enter as a pack, and more because I knew my poor Finn just wouldn’t be fit for it; but I knew that I wanted to take part again because it’s the most fun race I have ever done, and I’ve done many 5ks, 10ks, several half marathons and a couple of marathons. I also wanted to force this fun on my friend Beverly again, hence the pack entry. So there we were, podium finishers, and Spirit of Waggy Races recipients. The three of us were a tired but victorious sight; Beverly with a heavy sports bag on each shoulder, me with a 25 kilogram bag of Feedwell dog food over my shoulder and Murphy’s Barkery goodies in my hands, and Lord Mack, with his brand new KONG bear toy in his mouth and his medal around his neck. Passers-by looked admiringly at Mack as we walked back to the car, and my heart swelled with pride as they commented on how adorable he looked. 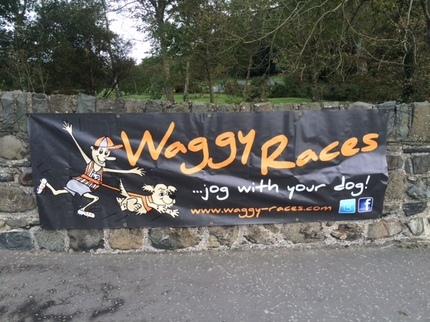 Waggy Races is no ordinary race – it has become an event where a family of like-minded people just love to run or walk with their dogs. I am so glad to have been the first person to enter, and wholeheartedly would like to thank Neil, Ruth and Zola for bringing this event to us all. From day one it has been well-oiled machine in terms of organisation, and it is definitely one of the most fun family days out to be had. I’m already looking forward to the next one – so’s Beverly! Mack, with medal round neck, sitting proudly on the podium after receiving the 'Spirit of Waggy Races' award.